Orthorexia nervosa is an eating disorder that was first discovered in 1997 by Dr. Steven Bratman. Dr. Bratman defines orthorexia as an unhealthy obsession with healthy foods. Orthorexics are obsessed with pureness unlike other eating disorders like anorexia and bulimia in which the food obsession is about weight and body image. If you have orthorexia nervosa, you may shun foods that you perceive as unhealthy such as foods containing refined sugar, Trans Fats and/or preservatives and follow strict rules that dictate what foods you can and cannot consume. While the goal of an orthorexic’s food obsession is healthy eating, the obsession can lead to considerable stress. This stress can cause more harm to your body than any good achieved from eating the healthy foods. Although orthorexia nervosa is not currently recognized by the DSM-IV or ICD, many experts confirm the validity of orthorexia as a mental health disorder and believe it should be included as a specific eating disorder. Other experts believe that orthorexia should be diagnosed as obsessive compulsive disorder as it meets the requirements of obsession (eating healthy and being pure) and compulsive behavior (following a strict diet). Someone with orthorexia nervosa will follow strict dietary rules. Orthorexia nervosa is a progressive eating disorder. If you have orthorexia nervosa, you are constantly preoccupied with food. You spend hours thinking about food, preparing meals, researching food and planning meals. You adhere to strict rules in regards to eating such as putting certain foods completely off limits – like refined sugar or hydrogenated oil. When you stray from these self-imposed rules, you experience intense guilt. In addition, you tend to be very open about your eating choices. You take pride in your perceived healthy choices and encourage others to adopt your healthy lifestyle. You typically have a high self-esteem or an abnormal sense of righteousness, especially when it comes to your diet choices. It is not uncommon for you to look down on others who do not follow the same dietary rules. You obsessive preoccupation with dieting and/or healthy foods puts you at risk of losing friends. This disorder typically begins innocently with your quest to live a healthier lifestyle and consume healthier foods. You begin to add a few healthy foods into your daily diet. You continue to add more and more healthy foods until you “only eat healthy foods” and shun those who choose to eat unhealthy foods. Over time, you begin to follow increasingly stricter rules in an effort to be at your purest. If you have this disorder you are at risk of becoming emaciated. When you get to the point where you are so obsessed with healthy foods that it is all you think about, you may have orthorexia nervosa. There is a fine line between what is considered a healthy fixation on food and an obsession. In order to differentiate between orthorexia and healthy eating habits, you must remember that to receive a diagnosis of orthorexia nervosa, the disorder must cause you significant distress. Therefore, if your eating habits do not interfere with your normal daily functioning, then you do not have orthorexia nervosa. Do you look down on other people who do not eat like you? Do you feel guilty if you stray from your diet? In recent years, western society has become increasingly obsessed with food. New findings on potentially harmful foods can encourage food obsessions such as orthorexia nervosa. Obesity has become a pandemic, spurring countless fad diets that often give unhealthy advice such as cutting out entire food groups. You are bombarded with information about food choices and advertisers frequently use scare tactics like promising to prevent cancer by eating their cereal (thus implying that the other cereals will cause cancer) to promote their products. Societal changes play a significant role in the development and progression of these types of eating disorders. Many who have developed orthorexia claim that their disorder began when they started making healthier food choices. They stated that over time the importance of eating healthy increased until it became an obsession that took over their life. If you have orthorexia nervosa, your children have an increased risk of developing the eating disorder through learned behaviors. If your children constantly hear you speak of how certain foods are considered “bad” they will start to develop fears about eating those types of foods. Constantly focusing on whether certain foods are “good for you” or “bad for you” can lead to a variety of eating disorders such as orthorexia, anorexia and/or bulimia. Orthorexia nervosa is a newly-recognized eating disorder so it has not been clearly defined by the DSM-IV. While it is difficult to find information on the prevalence of orthrexia, evidence suggests that the disorder is becoming more common and prevalent each year. 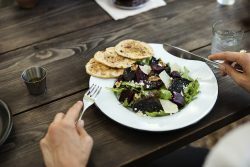 Orthorexia occurs equally in women and men, but the most commonly seen cases occur in middle-class adults, who are at least 30 years old and who have a college degree. Getz, L. (2009). Orthorexia: When eating healthy becomes an unhealthy obsession. Today’s Dietitian. Hill, A. (2009). Healthy food obsession sparks rise in new eating disorder. The Observer. Are there Effective Treatments for Orthorexia Nervosa?